New offering combines Micrososft's Xbox and Bing technologies to let users request content by voice. Microsoft today kicked off the Electronic Entertainment Expo (E3) in Los Angeles by announcing voice search with Bing will be available on Xbox 360 later this year. 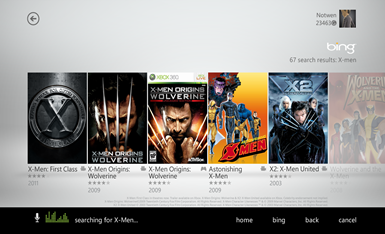 Through the power of Bing’s deep search expertise, Microsoft Tellme’s voice technology, and the magic of Kinect, Bing on Xbox provides instant access to the expansive catalogue of entertainment options on Xbox Live. Bing on Xbox will search Netflix, Hulu Plus and ESPN, as well as music, video and the Xbox LIVE Marketplace to find the exact games, movies, TV shows, sports and music users want to enjoy. It will also let them select, browse, or refine a search through simple voice and hand gestures in a fraction of the time it currently takes. "This is an incredible time of growth and innovation for our business leveraging technologies that see us, hear us, and connect us all together," said Don Mattrick, president of the Interactive Entertainment Business at Microsoft. "This year, by bringing together the power of Kinect for Xbox 360 and the intelligence of Bing, we are transforming how people enjoy entertainment." During the past two years, Microsoft has joined with some of the world’s largest TV operators to bring live television to Xbox LIVE, in the United Kingdom with Sky TV, in France with Canal+, and in Australia with FOXTEL. Now, Microsoft has announced its commitment to expand access to live television programming on Xbox 360 to more providers in the United States and around the world. Consumers will enjoy news, sports, and their favorite local channels, all just a voice command away, on Xbox 360. Also this year, Microsoft is teaming up with Ultimate Fighting Championship (UFC) to bring mixed martial arts programming to Xbox Live. It will feature live matches, classic fights, interviews, and exclusive behind-the-scenes looks into the lives of the fighters. Microsoft is also building on its expansive catalog of tens of thousands of movies and TV shows available on demand from Hulu Plus, Netflix, and Zune by bringing YouTube to Xbox 360. Users will gain access to Web content from around the world.